Low Carb Cookies and Cream Shake! Disclosure: I was given some THM Pristine Whey Protein Powder to review in this Cookies and Cream Shake, but all opinions are entirely my own. Update: I changed the name of this recipe to “Cookies and Cream Shake” 12.6.16 to avoid the name “Oreo” in the title for legal purposes. It’s the same recipe! How is it that I have ice cream and shake recipes out the Wazoo…but no cookies and cream versions anywhere to be found? Probably because I’ve never been a cookies and cream fan myself. Well, here I finally give you guys a cookies and cream shake (which can also be made into a single-serve ice cream recipe), but with a twist: “truffle” pieces (you know, like the truffles you make by smashing Oreos and cream cheese together). Don’t worry, it’s not that complicated. This is actually an invention of my sister Katelyn (she’s 13). One night I asked her if she’d make me a snack because a) I was feeling lazy and b) she was bored and c) I love seeing what she comes up with. She gave me a shake sort of like this one, complete with truffle pieces. I was so impressed that I stole her idea, tweaked it a little, and measured. I hate measuring, but when I publish recipes for the blog I feel a moral obligation to measure. I’m afraid to face the masses if I don’t. Edited to add: I now have a Cookies n Cream Ice Cream recipe which can be found here. It contains bits of crunchy chocolate cookie pieces that you can also use in shakes like this one (if truffle pieces aren’t your thing)! Not only did I want to share this shake recipe with you guys, but I wanted to try out my new Pristine Whey Protein from Trim Healthy Mama! I got some Baking Blend too, which you’ll be seeing in a recipe very soon… I have been so impressed with the quality of all of Trim Healthy Mama’s products (which can be purchased through their online store), and the protein powder is no exception. It is gluten free and GMO free and is processed using a cross-flow micro filter process (you can learn more about this on the Trim Healthy Mama store site). The whey protein powder is very fine and dissolves great. Containing 20 grams of protein per scoop, this protein powder turns a shake like this recipe into a meal or snack (or dessert!) great for any time of day. You can even have a naughty-tasting mock “Oreo” truffle shake for a post-workout boost! The shake part of this recipe can be used as a great basic shake recipe that you can add anything to. It’s an S for Trim Healthy Mamas (you can click here for my quick synopsis of this eating lifestyle), but if you leave out the cream and use low fat cottage cheese, the base itself is a FP. Want a chocolate truffle shake? Just add a tablespoon of cocoa powder and some extra sweetener to the shake base! Want some soft-serve cookies and cream ice cream? Freeze the shake after stirring in your truffle pieces; you’ll need to freeze for 30-60 minutes, stirring occasionally, until the ice cream reaches your desired consistency. I hope you enjoy this truffle-laden shake as much as I did. It’s seriously chock-full of truffle pieces and healthy protein. What more could you ask for? Please note that the brownie/truffle part is not meant to be eaten by itself. It’s nothing spectacular on its own, but rather meant to be crumbled up into the shake. If you need a real brownie recipe, here’s a single-serve recipe and here’s a full pan recipe. THM:S, Low carb, Sugar free, Gluten and Peanut free - the truffle pieces in this remind me of Oreo truffles! Make the truffle first. Mix all the ingredients except for the cream cheese together and microwave for 50-60 seconds or until just dry on top. Mash the cream cheese and the brownie mixture together and set aside (refrigerate or freeze while making your shake if you want the truffle to stay in bigger pieces instead of crumbling). Make your shake. Combine all the shake ingredients and blend until completely smooth (I use my Ninja single-serve blender attachment). The longer you blend, the fluffier your shake will be. Stir the truffle mixture into your shake and enjoy! Trim Healthy Mamas, you can make a FP (not quite so good) version of this shake by omitting the cream, using low-fat cottage cheese, and using Greek yogurt in the truffle instead of cream cheese. I changed the name of this recipe to "Cookies and Cream Shake" 12.6.16 to avoid the name "Oreo" in the title for legal purposes. It's the same recipe! I use my Ninja single-serve blender cup all the time, and it makes this recipe so smooth! The cup comes with this Ninja blender set. Glucomannan serves as a thicker/creamifier in this shake. Coconut flour can be purchased here. THM Pristine Whey Protein Powder and Pure Stevia Extract Powder (my sweetener of choice; it’s so much better than any other stevia I’ve ever tasted!) can be purchased from the Trim Healthy Mama online store. I have to tell you- I’ve been making this almost every single day because it’s AMAZING!!! I put it in a bowl with whatever low carb crunchy stuff I have so it handles my ice cream cravings. My kids love it too- thanks for the great recipe! Haha…that’s awesome! Maybe someday they’ll want to join you. Even my (picky!) husband loved the Cookies and Cream Shake! ? Wow! Just made this to share with my DH, he is under the weather and I have a hard time getting him to eat healthy. This is so good, I was out of cream cheese so I used Greek yogurt and I added about 1/2 c of okra, because I always add vegt to smoothies. It is fabulous, like old time drug store shake good! Thank you! Do you typically use 4% cottage cheese unless stated otherwise in your recipes? Awesome, thanks! I’m heading to Sam’s tomorrow. My local store carries 2% and 4%. So I will just buy 2% rather than both. Thanks again! Can I use almond flour in this? I hate the taste of coconut. Yes, you’re welcome to use almond flour but you’ll need to use more since it’s not as dry as coconut flour. I very rarely use almond flour so I’m not sure what the ratio would be. This is my new favorite shake! I love it! Oh yum! How did I not know this existed? Looking forward to trying it out! This is fantastic and doesn’t bloat me like one made with ice cream, plus no sugar spike/crash. You are brilliant! LOVE the THM Whey protein! It doesn’t leave the “grainy” mystery chunks in my shakes, smoothies, and most importantly my coffee!! 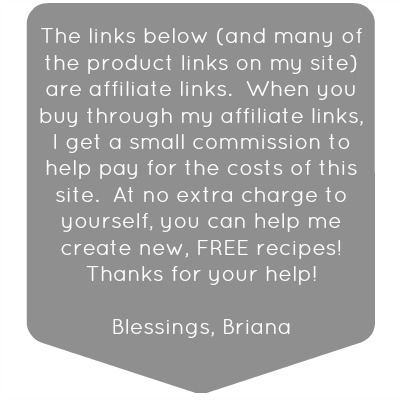 Your blog ROCKS Briana!! Thank you for all your hard work! You make this lifestyle so doable for me!!! I am in the middle of making your white cake recipe and now this!? It looks so good!! You are officially my hero! I LOVE cookies and créme everything. I’m eating the truffle right now lol. Gotta wait for ice to make the shake 😀 thanks, again, Briana!! I think this will be my snack this afternoon. It looks fabulous!! Oh, and I really love THM whey protein powder. It always makes my smoothies and shakes so thick and creamy!! Thanks for another great recipe. Please do those of us not good in math a favor and tell us how many approximate doonks equal a teaspoon? We’ve scrambled our brains trying to figure it out! Hi June! As I said in the recipe, a doonk is equal to 1/32 tsp. Therefore, it takes 32 doonks to equal a teaspoon.